As neutral certification body, the European Certification Body GmbH has more than 40 years of experience in the testing, certification and quality surveillance of security technology. In 1992, the European Certification Body was accredited as certification body according to ISO/IEC 17065. 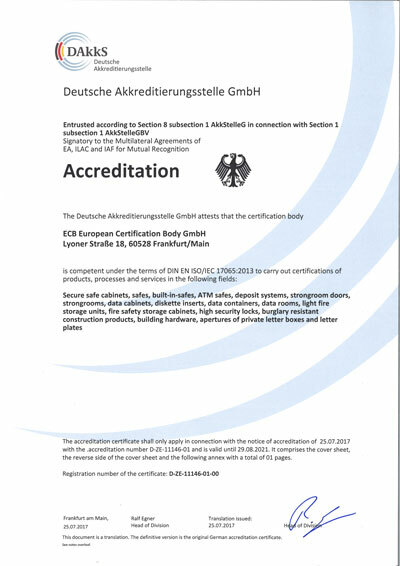 The responsible accreditation body is DAkkS Deutsche Akkreditierungsstelle GmbH. The accreditation certificate is confirmation of the European Certification Body`s competence according to ISO/IEC 17065 to carry out the certification of security products in accordance with the relevant European standards. DAkkS has signed the Multilateral Agreement of the European Co-operation for Accreditation (EN-MLA) for product certification. The ISO/IEC 17065 is the official replacement of the standard EN 45011. From 15 September 2015 on, the ISO/IEC 17065 is the only valid standard for accreditation. If existing laws and regulations are still referring to the old EN 45011, the ISO/IEC 17065 is applicable. A certificate issued by European Certification Body GmbH fulfills these requirements.